Jasminium is a genus of 200 or more species of deciduous and evergreen shrubs and climbers from woodland, scrub and rocky places in tropical and temperate regions of the world. 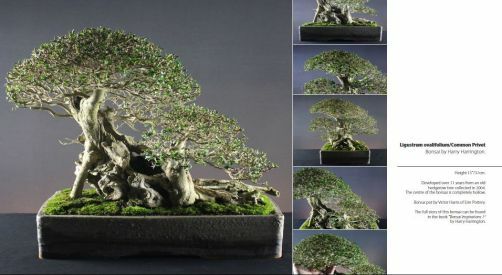 There are however only two Jasminium species that I have encountered as bonsai. Both species are suitable for informal upright and cascade forms with single or multiple trunks in small to medium sizes. Propagation is by cuttings or air-layering. J. nudiflorum is a slender, deciduous shrub native to China with arching green shoots and opposite, pinnate, dark green leaves, each divided into 3 oval-oblong leaflets to 3cm long. Solitary, bright yellow flowers to 1 cm across are produced in the leaf axils, before the leaves, in Winter and in early Spring. J. nudiflorum requires a sunny position and is tolerant to frost but requires protection when temperatures drop below -5°C. Feeding should be carried out every two weeks from the end of flowering until Autumn. Flowers appear on old wood and shoots can be pruned back from late Spring to Autumn. Repot every one or two years in Spring after flowering. J. officinale is a vigorous, twining, woody deciduous climber with opposite, pinnate, mid-green leaves composed of 5-9 elliptic leaflets to 6cm long with sharp points. Fragrant, white flowers are produced from Summer to early Autumn. Common Jasmine is not fully hardy and it is common to grow inside during the Winter if a frost-free place outside cannot be afforded. During the Summer place outside in full sun. Repot in Spring every two or three years as new growth extends. Prune back after flowers fade and trim new shoots in late Spring and Autumn.